Prologue: The chemical bond on the eve of the 21st century (Z.B. Maksi&cacute;, W.J. Orville-Thomas). 1. Theoretical treatise on molecular structure and geometry (J. Cioslowski). 2. Beyond the Born-Oppenheimer approximation (D.B. Kinghorn, L. Adamowicz). 3. The Mills-Nixon effect: Fallacies, facts and chemical relevance (Z.B. Maksi&cacute; et al.). 4. Predicting structures of compounds in the solid state by the global optimization approach (J.C. Schön, M. Jansen). 5. Polarizability and hyperpolarizability of atoms and ions (D. Bishop). 6. Molecular polarizabilities and magnetizabilities (P. Dahle et al.). 7. The concept of electronegativity of atoms in molecules (J. Hinze). 8. On hybrid orbitals in momentum space (J.B. Clark, H.L. Schmider, V.H. Smith, Jr.). 9. Theory as a viable partner for experiment - the quest for trivalent silylium ions in solution (C.-H. Ottosson, E. Kraka, D. Cremer). 10. Bond energies, enthalpies of formation, and homologies: The energetics of aliphatic and alicyclic hydrocarbons and some of their derivatives (S.W. Slayden, J.F. Liebman). 11. Stabilization and destabilization energies of distorted amides (A. Greenberg, D.T. Moore). 12. Some chemical and structural factors related to the metastabilities of energetic compounds (P. Politzer, J.S. Murray). 13. Valence bond theory: A re-examination of concepts and methodology (R. McWeeny). 14. Advances in many-body valence-bond theory (D.J. Klein). 15. Ab initio valence bond description of diatomic dications (H. Basch et al.). 16. One-electron and three-electron chemical bonding, and increased-valence structures (R.D. Harcourt). 17. Valence bond description of &pgr;-electron systems (J. Paldus, X. Li). 18. The spin-coupled description of aromatic, antiaromatic and nonaromatic systems (D.L. Cooper, J. Gerratt, M. Raimondi). 19. Aromaticity and its chemical manifestations (K.B. Wiberg). 20. Hypercoordinate bonding to main group elements: The spin-coupled point of view (D.L. Cooper, J. Gerratt, M. Raimondi). 21. The electronic structure of transition metal compounds (G. Frenking, C. Boehme, U. Pidun). 22. Fundamental features of hydrogen bonds (S. Shiner). 23. Molecular similarity and host-guest interactions (P.G. Mezey). 24. Chemical bonding in proteins and other macromolecules (P.G. Mezey). 25. Models for understanding and predicting protein structure (D.F. Mere). 26. Possible sources of error in the computer simulation of protein structures and interactions (J.M.Garcia de la Vega, J.M.R. Parker, S. Fraga). 27. The nature of Van der Waals bond (G. Chalasinski, M.M. Szczesniak, S.M. Cybulski). 28. The nature of the chemical bond in metals, alloys, and intermetallic compounds according to Linus Pauling (Z.S Herman). Epilogue: Linus Pauling, quintessential chemist (D. Herschbach). Index. Theory and experiment in chemistry today provide a wealth of data, but such data have no meaning unless they are correctly interpreted by sound and transparent physical models. Linus Pauling was a grandmaster in the modelling of molecular properties. Indeed, many of his models have served chemistry for decades and that has been his lasting legacy for chemists all over the world. 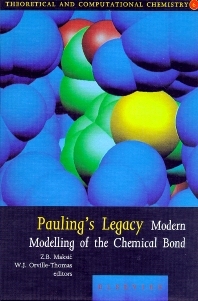 The aim of this book is to put such simple models into the language of modern quantum chemistry, thus providing a deeper justification for many of Pauling's ideas and concepts. However, it should be stressed that many contributions to this work, written by some of the world's most prominent theoretical chemists, do not merely follow Pauling's footprints. By taking his example, they made bold leaps forward to overcome the limitations of the old models, thereby opening new scientific vistas. This book is an important contribution to the chemical literature. It is an almost obligatory textbook for postgraduate students and postdoctoral researchers in physical chemistry, chemical physics and advanced physical organic chemistry.